APPLICATIONS OPEN FOR 2018 FILM SOCIETY OF THE YEAR AWARDS! 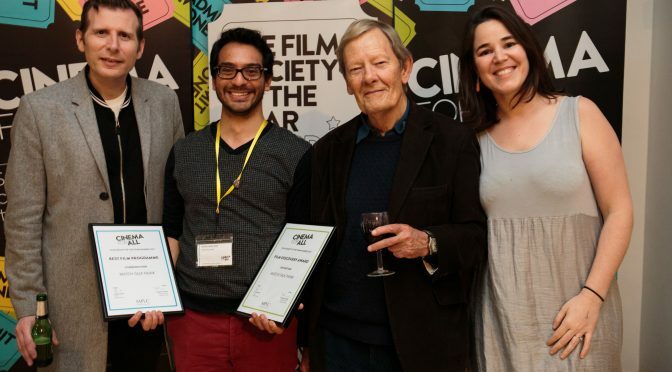 APPLICATIONS NOW OPEN FOR 2018 FILM SOCIETY OF THE YEAR AWARDS! Application forms for the 49th Film Society of the Year Awards are now available! The Awards are our proudest tradition, and celebrate the hard work of the volunteers who bring film to communities all across the UK. There are 11 awards to apply for, from our newest award Best Single Event, to the overall prize of Film Society or Community Cinema of the Year. Your audience can also take part through the Filmbankmedia Award, in which you can be in with a chance of being awarded £1000 to support your activities! The awards are open to all volunteer-led community cinemas, film societies, film clubs, pop-ups and community festivals. To apply, simply fill in the form for the relevant category. Each form asks 4-5 simple questions, which will help you give the information the judges are looking for. We encourage you to try your hand at several categories to increase your chances of winning! The purpose of this question is help you get across the special qualities of your organisation, in a way that you may have been unable to express in your previous answers. You may submit this as 200 word text response, or a 2 minute audio file, or a 2 minute video file. Return your completed application to awards@cinemaforall.org.uk by 30 June *extension until 4 July*. Be sure to carefully read our Guidance Notes, as these will help you with your application significantly. You can also find out more about the judging process and how we select our panel here. The awards take place on Saturday 8 September at the Showroom Cinema in Sheffield, as part of our Community Cinema Conference weekend. Tickets will be available very soon – we cannot wait to celebrate with you!